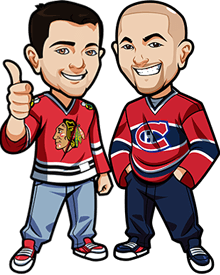 Welcome to the NHL Betting Sportsbook Reviews section of BetNHL.ca. If you’re looking to bet on the NHL then we highly recommend betting with only the sportsbooks listed on this page. This page is geo-targeted. What that means is this page is set up to show the best sportsbooks for United States. Yes – there is a lot of online sportsbooks out there – but these are the ones I personally use, trust and would recommend. You may want to have an account at ALL of these sportsbooks – the reason for that is due to all the different promos and odds. Why bet $10 to win $9 when you can bet $10 to win $9.50? Or even bet $10 risk free, as these books often e-mail free bet promos for games. Formerly known as Bodog, Bovada are probably our #1 choice for Americans looking to bet NHL Hockey. Read all the details in our Bovada Review. GT Bets are a sportsbook that accept Americans. Honestly compared to a lot of other sportsbooks it's only worth really signing up here if you're American, or churning through bonuses. See our GT Bets Review for all the details. Intertops are lacking in a lot of aspects - their mobile site is weak, and they don't offer a lot of betting options. However if you are just betting the games, moneylines, spreads or over/unders then this is a great sportsbook - they have a solid bonus and a FANTASTIC rewards program. They really reward regular betters, so that is one thing to keep in mind. Read more about the Intertops Reward Program or read the full Intertops Review. Not only is Nitrogen Sports the best Bitcoin sportsbook for NHL but honestly they have the better odds a large portion of the time. It's worth figuring out and understanding Bitcoin so you can take advantage. Read our Nitrogen Review for more details. 5Dimes offer a lot of reduced juice lines and great odds - plus they also offer 1st Period Lines, 2nd Period Lines, 3rd Period Lines and unique props, as well as a decent bonus and rewards program. The only reason they aren't on the top 3 above is because their website interface is not good at all, and their mobile site is dreadful. For more details, read our 5Dimes Review. BetOnline are a fairly solid sportsbook, although they focus more on NFL, NBA etc. They do however offer $25 free to try out their live betting, and also offer an unlimited 25% free play bonus - meaning you get free money on EVERY deposit you make at BetOnline. Read our BetOnline Review to see if this is the sportsbook for you - at the very least, they are worth trying for the $25 free bet for in-play betting. Maybe you don't live in USA but are visiting this page. You're from Scotland, bored out of your skull and are just browsing the web. Here's a list of sportsbooks for non-Americans that we recommend. Read our Sports Interaction Review. If you watch TSN a lot you've no doubt heard of Bodog. The one thing they are lacking is a good mobile version of their website. Everything else is great however - from the crazy amount of props they offer to the $100 free to all new sports betters. PLUS they offer in-play betting so you can bet during the game. Check out our Bodog Review for more details or head on over to Bodog.ca. Bet365 are a sportsbook that have EVERYTHING. They have a mobile website, and mobile apps for the iPhone and Android. They have live streaming, live betting, a wide variety of betting options, and also a parlay bonus if you like to bet 3 or 4 teams under the one bet, ala Pro-Line. You can read our full review or visit http://www.bet365.com. If sportsbooks were grocery stores, Pinnacle would be No Frills. They don't offer a bonus, they have no rewards program, their mobile site is weak, and their interface looks like it was built in 1998. But all that doesn't matter - they will, 90% of the time, have the best odds of ANY sportsbook online, meaning you will almost ALWAYS get more cash back at Pinnacle. Go check out their lines now and compare it to your own sportsbook, or read our Pinnacle review for more details. You know 888 are a trustworthy brand because not only are they publicly traded, but UFCs Georges St-Pierre recommends them and he's a smart businessman who isn't going to hook up with anyone shady. They offer $150 in free bets, live betting, mobile apps and a mobile site. The only real negative is their lack of unique betting options for hockey. Read more in our 888 Sport Review. William Hill are an excellent sportsbook who often have better odds than the rest. I'd say at least 5 times a week we're placing bets there as opposed to other sportsbooks. They also have a wide variety of unique betting options. See the William Hill Review for all the details. If there's any online sportsbooks we didn't mention that you are looking into, feel free to send us an e-mail(link in the sidebar) and I'll let you know whether that sportsbook is good or not. I've got a lot of experience with betting hockey online, so I know who the best ones are and who to avoid.